For the third lunch in my Spider-Man: Into the Spider-Verse series, I had to make Spider-Gwen for my daughter. Gwen was her favorite and definitely an awesome part of the movie. Gwen Stacy died in the original Spider-Man universe but became Spider-Gwen in another dimension. She was saving the world over there until the events of Into the Spider-Verse happened. I won't give away any more, because you really should see the movie, but just know that she is an amazing part of it. 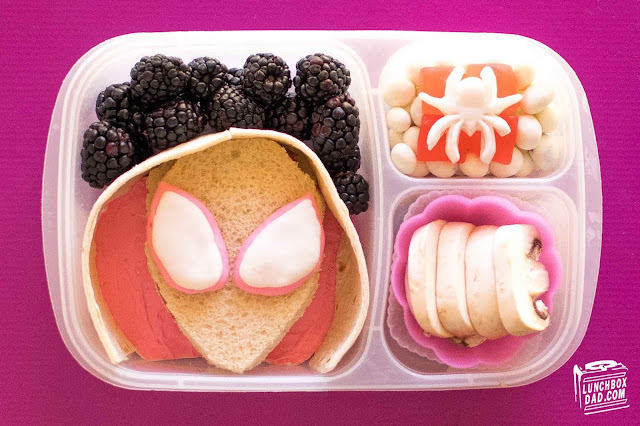 I made the lunch in an Easy Lunch Boxes container and tried to keep to the pink, white, and black color scheme of her costume. I'll just include the ingredients because you can just look at the photo make it. Her hood was the trickiest part but that is just mainly tortilla and strawberry cream cheese. You can check out her movie trailer below to find out more info! 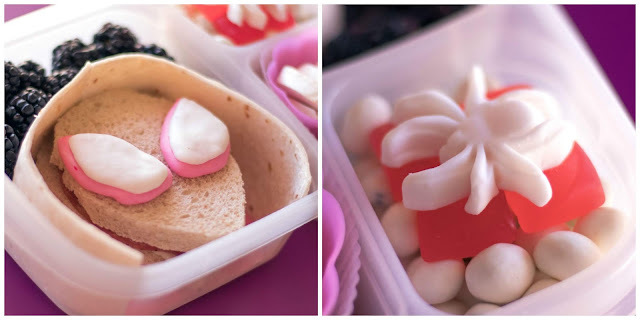 Head: Sliced white bread for mask, sandwich filling, pink and white fondant for eyes. Tortilla and strawberry cream cheese for hood. Surrounded by blackberries. Side compartments: Mushrooms in silicone cup, yogurt covered raisins, pink gummy candy and white fondant spider.